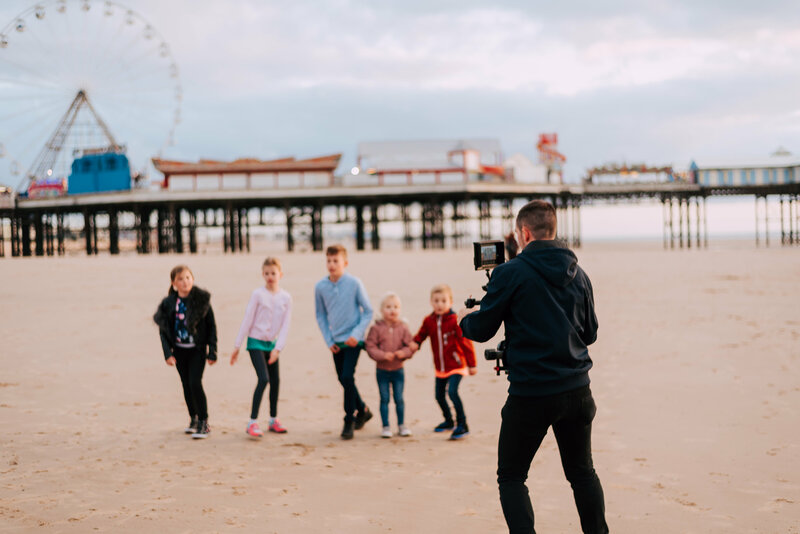 We are proud to present our NEW TV Advert, all produced in-house, using local children and families and showcasing the amazing moments that can be enjoyed on a Ribby Hall Village holiday! Scroll down for an insight into one of the filming days! Ever wondered what it is like to create an advert like this? Is it really time to get up? No really – is it? Just five more minutes… snooze! OK, yes it really is time to get up. It’s dark and cold outside but something very exciting awaits. Coffee down; and I’m on the road! Today is the first day of filming for an exciting new TV advert for Ribby Hall Village. This is an exciting project that I can’t wait for and am so happy to be involved with. 4.35 though… it will definitely all be worth it! I arrive and meet Matthew from the Ribby Hall Village Marketing team; he came up with the concept for the advert and had the vision – so now we need to make it a reality. Our first scene is in the Leisure Pool. The new pool has had a massive re-vamp costing £1.6 million – new slides, new toddler area – the works, so this is pretty exciting AND we have it all to ourselves. Slightly worried for my cameras though – water plus technology generally equals a potentially massive fail 🙁 but I know they are in good hands with Matthew – no pressure Matt! We decided for this ad that all the people featured would be ‘real people’, not actors or models. So first up it is Michael and Freddie, father and son on the new racer slides. They take the competition very seriously – I think Freddie won, or at least that’s what we told him to keep him smiling! What feels like about 100 takes later – we’ve nailed it! Freddie and Michael can finally get dry. Nice one guys! Freddie’s sister Scarlett is now up and her part is to run and jump into the swimming pool. As I’m giving her direction and showing her what we need her to do, I run up and nearly fall in the pool – fully clothed, with camera in hand. That would have been a quick finish to the day! Luckily I manage to get my balance and the day continues. Phew! Like a true professional Scarlett only needs a few takes – she has excellent jumping skills! Thanks Scarlett. Young Josh and Chloe arrive and we put the new toddler and children area of the swimming pool to use. They play in the water fountains and go down the slides; this is the best work ever! After half an hour or so we have what we need and I have to be honest by this point we’re glad to escape the heat of the pool – it’s hot when fully dressed and lugging equipment around. STARBUCKS! It was an early start and it was hot in the swimming pool, so by 9am coffee is much needed! After a Pumpkin Spiced Latte is consumed we go on to the soft play area in the Activity Hub. Ribby Hall Village recently invested in a new activity hub especially for toddlers and younger children, so that’s where we are off to next. 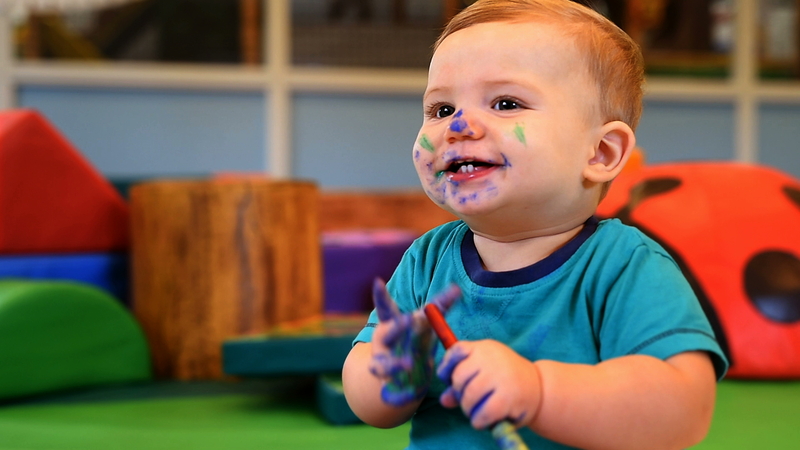 We film two more scenes with baby Harrison doing messy play and little William in the play area. But really it’s just an excuse for Matthew and I to play in the soft play and go down the slides whilst holding all of our equipment! We don’t miss the opportunity, and about half way down the slide I start to wonder what my insurance company would make of this method of equipment transportation. Unfortunately we were caught on camera and there is video evidence. We were working…honestly! 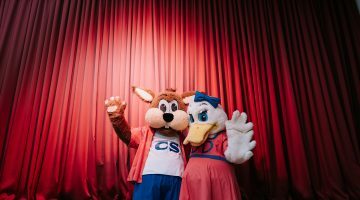 No holiday at Ribby Hall Village is complete without a trip to The Bar & Grill for some fabulous entertainment, so scene three is party dances with the wonderful Gareth and Dizzy Duck! After some serious hokey-cokeying and lots of hugs with Dizzy, scene three is in the bag and Matt and I are ready for some food – we both look at each other and agree; PIZZA! One of the lunch time musts at Ribby Hall Village has to be Papa John’s Pizzeria, so we head over. Once all of our equipment is plugged in to charge, we order our pizza and sit down to look at what we’ve filmed so far. We’re happy with what we have and fill our bellies with some yummy Papa John’s before heading out for the second part of the day. It’s raining, oh dear, this wasn’t part of the plan. It would appear that storm Brian has arrived, where did he come from? He wasn’t invited! Oh well, the show must go on and next up its archery. 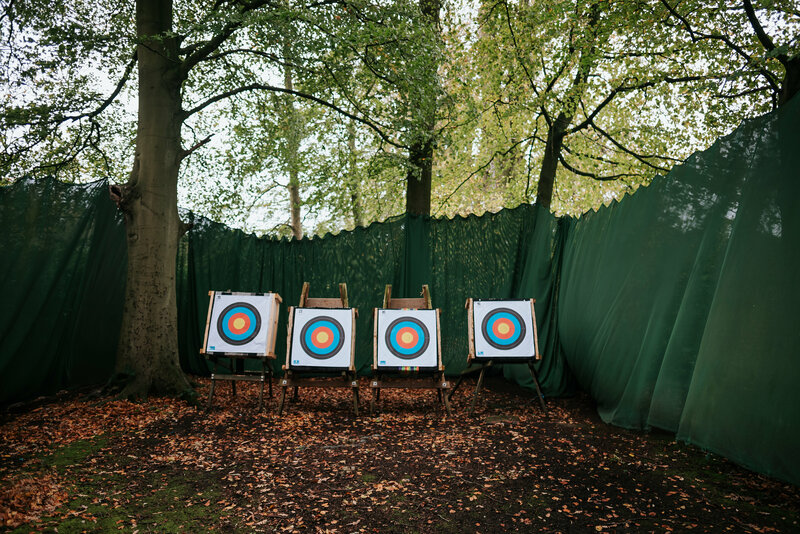 There are sooooo many activities on offer at Ribby Hall Village and archery is one of my favourites. You’re under shelter so if the weather is bad – it doesn’t matter. For this scene we have young Joe joining us. He has done archery a couple of times before, but as this is for the big screen, he gets some tips from the instructor before we roll cameras. Whilst this is going on I get very excited about the prospect of being in charge of the boom (the big furry microphone thing that records sound) – it’s a lifelong dream ticked off the list. Once Joe is up to speed and firing arrows like Robin Hood we go live and get the footage in a couple of takes! Well done Joe! 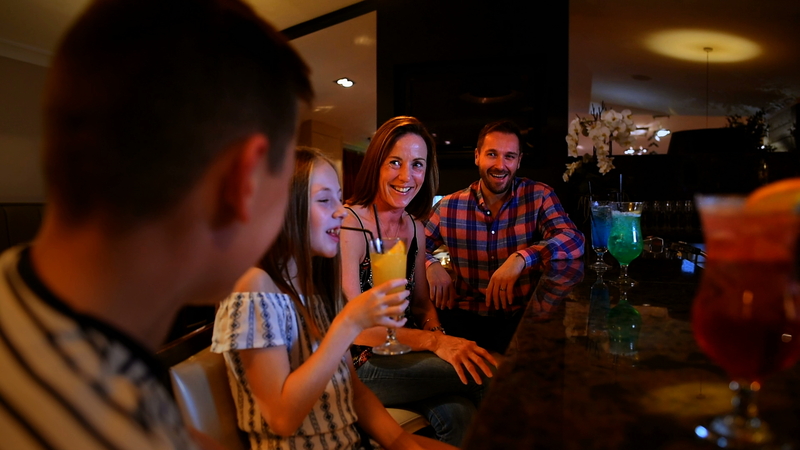 We move in to The Tapas Bar & Restaurant’s Cocktail Bar with the Tregonning family to film them enjoying some cocktails (obviously non-alcoholic for the kids!). Adam is our expert cocktail maker and does us proud. And once that’s done it’s a wrap on day one and I quite fancy a cocktail of my own! We are done – well for today anyway! Same again tomorrow, Matthew? 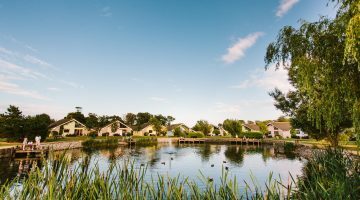 For the second day schedule we have the zip line, Wild Discovery, Blackpool beach, The Woodland Trail and biking down by the Pine Lodges. Phew, there are so many awesome things to do at Ribby Hall Village I’m not sure how we’ll squeeze everything in to 30 seconds! 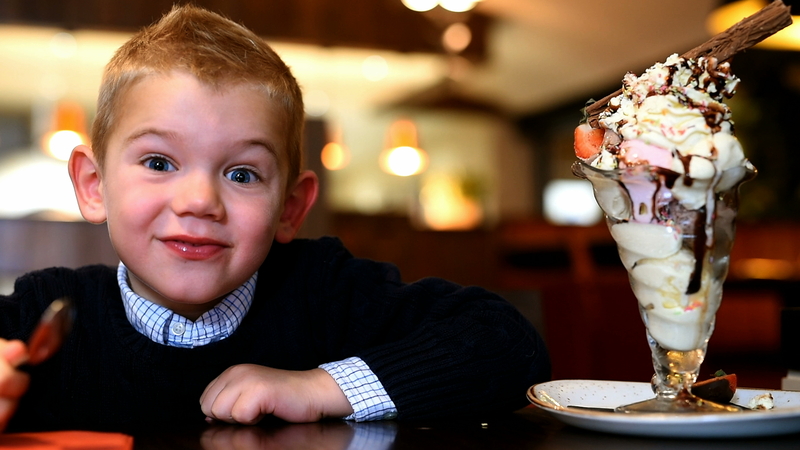 But now, time for bed…and dreaming of giant ice creams and doing the hokey-cokey in my sleep. 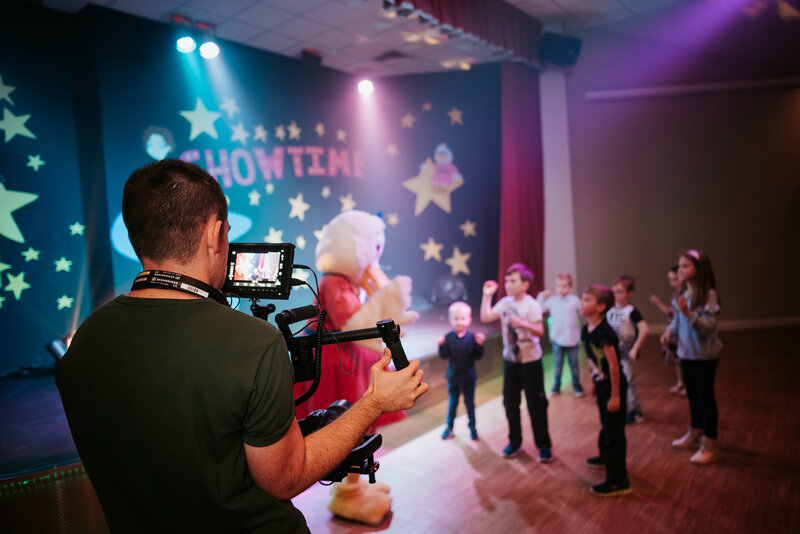 Look out for our new TV advert broadcasting on Nickelodeon, Disney Junior, POP, Cartoon Network, NickJr, Boomerang, Milkshake, ITV & STV. Kirsty Counsell worked at Ribby Hall Village in the Marketing team for six years, and whilst she has now left to run her own business is still involved with the Marketing side of Ribby. She is a keen photographer and loves to write and when she isn’t working for Ribby Hall Village you will find her at a wedding snapping away behind the camera.